The Huayra hangs out with some fellow supercars outside the George V hotel. Pagani&apos;s follow up to the Zonda, the Huayra, has been spotted on a public road for the first time ever over the weekend. One of only a handful built so far, the Huayra looks impressive sitting outside the George V hotel in Paris. 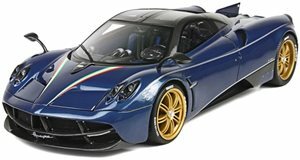 The Pagani Huayra features a 6.0-liter twin-turbocharged V12 engine and looks terrific parked next to a Bugatti Veyron. The engine, built by AMG, produces a serious 700 horsepower and 740 pound-feet of torque. A lightweight build with plenty of carbon fiber and aluminum allows the Huayra to sprint from rest to 60 mph in 3.3 seconds and reach a top speed of 230 mph.